Yeah, I know that the title of the recipe involves beef and pork, but really those aren’t the stars of the show. The stars of the show are all of the local vegetables and herbs that go into the bowl on top of the steamed broken rice, long before the grilled beef and pork even come into the picture. But those radishes only tell part of the story. Please note the plethora of mixed baby greens we sheared carefully from our salad bed in our community garden plot. Purple mizuna, various baby lettuces and burgundy colored tatsoi are included in the big pile of salad greens Kat and I cut for dinner. Two days later, you could barely see where we had harvested–the plants grew that fast. We also picked a great many herbs from the bed dedicated to them in the garden: spearmint, cilantro, basil, lemon basil and lovage. And then, in addition to our own herbs and vegetables, we had fresh local tomatoes, (From Star at Shade River Farm–she starts them in the middle of winter in her solar greenhouse) cucumbers, turnips, red cabbage, carrots and scallions from the farmer’s market. Counting all of that and the steamed broken jasmine rice, this dish is way more vegetative than its name would imply. But, it is based on the classic Vietnamese dish, Lemongrass Beef. Which, again, is a name that is somewhat misleading because the name doesn’t really tell you what all is going to be happening in your bowl, so maybe it’s traditional or something to just not talk about the rice, vegetables and herbs that outweigh the meat in the dish by many ounces. 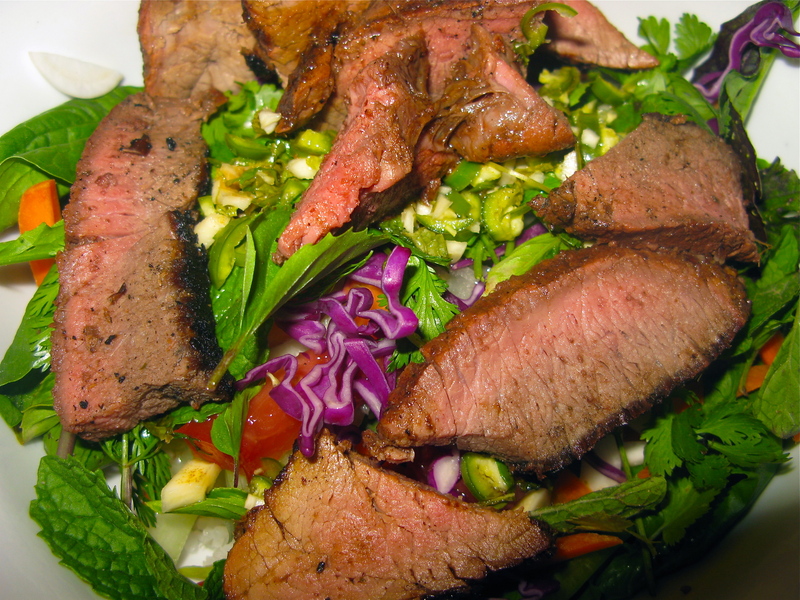 When I say based on, I should clarify–it’s loosely based on Lemongrass Beef. The meat is grilled instead of stir-fried, and while the rub contains lemongrass, there is a finishing sauce I made to use while the meat is sizzling on the fire that contains very little that resembles the original recipe. The sauce is made of a combination of fish sauce, soy sauce, lemon juice, honey, whiskey, vegetarian (or if you aren’t allergic to seafood like I am, regular) oyster sauce, and Thai sweet chili sauce. A word about that last ingredient–it’s meant to go on grilled chicken and it’s lovely that way. But, I like it even better with pork, and it’s really good on top of a bowl of Lemongrass Beef. The sticky-sweet, lightly tangy and fiery scarlet sauce is so good that it is addictive–which is why we gave it the nickname, “Cracky-Crack Sauce” at our house. The marinade/barbeque sauce really made the grilled meats taste fantastic. Don’t get me wrong–the rub I put on the beef and pork made them tender and taste fantastic–I mean, it’s fresh lemongrass, lemon juice, garlic, ginger and scallions–how can it make anything bad? But the sauce when added at the end, really gives it the extra added oomph that tips the meat over the top. Finally, you need to make nuac cham–a spicy, fragrant Vietnamese sauce that is like one of the best salad dressings in the world. As the final touch, it enhances not just the grilled meats, but the rice, the vegetables and the herbs. It’s great stuff. AND, it’s easy to make and keeps nicely in the fridge for about a week, though I like it best the day it’s made or the day after. Also, before serving, I like to bring it to room temperature so that the fullness of flavor is expressed. 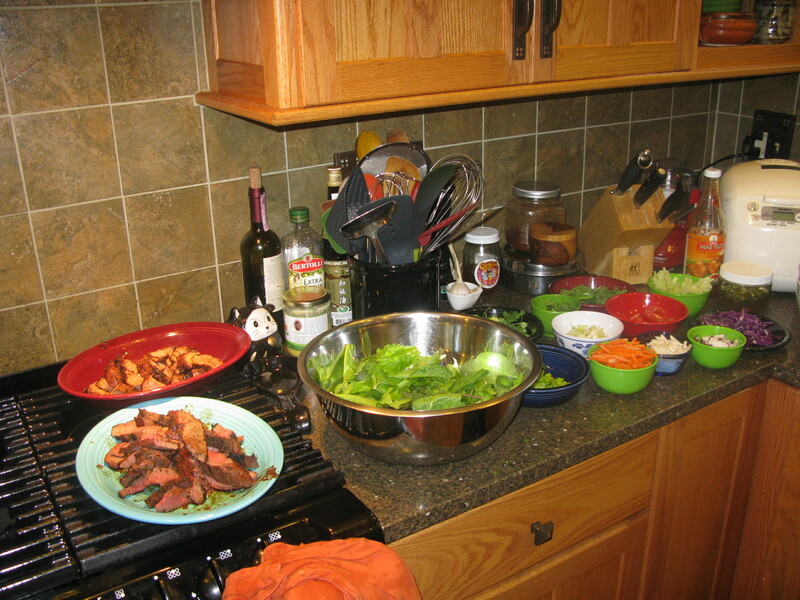 It sounds like lots of work–making two sauces, a marinade/rub, grilling meats, making broken rice or plain jasmine rice, and prepping the vegetables and herbs. But, really, the vegetables and herbs can be cleaned and cut a day before, the nuac cham can be made a day before, and the marinade and finishing sauce can all be made up to two days before. That leaves just the grilling, rice cooking and assembly for the day you serve the meal. That isn’t so bad, and the payoff is you get lots of fresh local vegetables and herbs, some rice and really tasty grilled meat in amounts that feed a whole crowd of your friends and family. The finished dish looks impressive and theirs something to please everyone. Grind all solid ingredients into a paste, then mix with lemon juice and fish sauce. Rub onto meats, then lay the meats into a shallow pan and seal with plastic wrap. Allow to marinate for at least three hours, preferably more, up to overnight. Whisk together and allow to sit at room temperature for at least an hour before use–if you make it a day or so ahead, warm up to room temperature before using it. 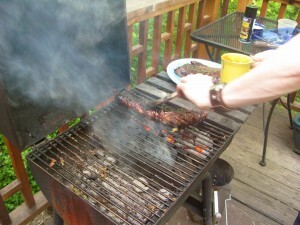 To grill the meats–prepare a charcoal grill for very hot indirect grilling, and cook the meats in the section not directly over the flame, turning at least twice until they are nearly done. At that time, move them closer to the actually burning coals, and brush several times on both sides with the sauce, allowing the outside of the meat char and crisp up a bit. whatever fresh vegetables you want to use such as carrots, radishes, baby turnips, snow peas, cucumbers, and tomatoes, all cleaned, dried and chilled. Cook the broken rice: In the rice cooker, put 3 cups of rice and water. (Always use equal parts rice and water for broken rice.) That is that. You put it in the rice cooker, shut the lid down on it, push the button and walk away. If you are cooking on the stove top, the proportion of broken rice to water is exactly the same. Put the rinsed rice into a pot with three cups of water. Bring to a boil, give it a nice stir, clap a tight lid down on it, turn the heat down to the lowest setting possible setting and cook for twenty minutes. Let it sit for five minutes off heat, then fluff with a fork. The lettuces and greens should be torn into bite sized pieces. 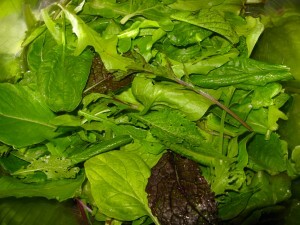 Choose greens that are a good balance of color, texture and flavor. I like to add some baby bok choy or tatsoi and mizuna to the greens because they are very flavorful and have great textures. The root vegetables should be peeled if needed, if not, they should be well scrubbed, and then cut into a thin julienne. Snow peas should be stringed and then cut into julienne to match the root vegetables. I like to peel the cucumbers and seed them, then cut into julienne. Tomatoes, if they are full sized, I just cut into thin wedges, while cherry tomatoes get simply sliced in half. 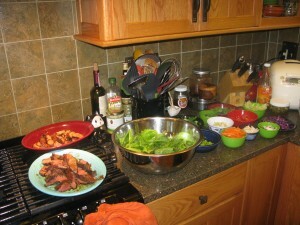 To serve, I slice the meats thinly on the diagonal and set them on platters on one end of the serving surface. I leave the rice in the rice cooker, with the lettuces in a large bowl near it on the other end. Then, the vegetables and herbs are in separate bowls arrayed in between the two ends, with the nuac cham and chili sauce after the meat. Pass out bowls and let your guests fill them as they see fit. I find it’s tastiest to put the greens in first, then the steamy rice, then the vegetables and herbs covering the rice, with the meat on top, and the sauces drizzled joyfully over the top. If you have leftovers, and that’s a big if, you can make a cold salad out of everything with a big dose of cold nuac cham as a dressing the next day. I ate it for breakfast and it was a delightful eye opener. Wow! This sounds like my definition of soul food – rice, meat and veggies mixed in with some spicy-sweet sauce. I shall try this soon. This looks really tasty! 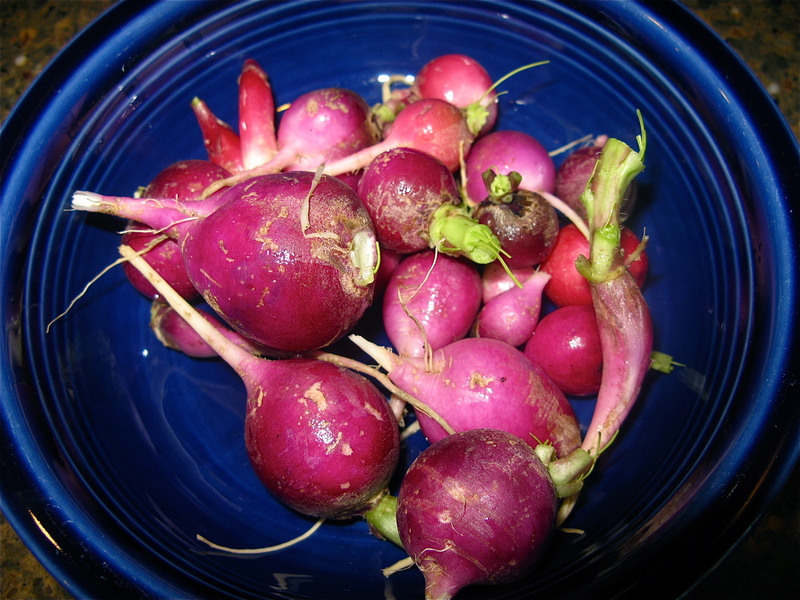 I love radishes, this is a great way to eat more of them. I’ve got some Vietnamese cilantro growing in my herb garden, I wonder if that would work in place of regular cilantro. What brand of veggie oyster sauce do you use? Amoy brand makes the tastiest version. I used to use their oyster sauce with dried scallops in it, before I started being allergic to shellfish. That brand of oyster sauce was the best I’d ever tasted.